**** Chosen by Winner: Andrew K.
Cliff Parker creates knives that push the limits of what is possible. This exquisite Fear The Reaper Damascus Linerlock Folder is a very sleek profile with a total thickness of just 0.281 inches! Due to the complexity of the mechanism, liner locks tend to be fairly thick, but Cliff has managed to build linerlock folders that are both sturdy and incredibly thin and low profile as possible. The 2.812-inch blade is formed from Cliff's Random pattern Damascus (1084 & 15N20) steel. 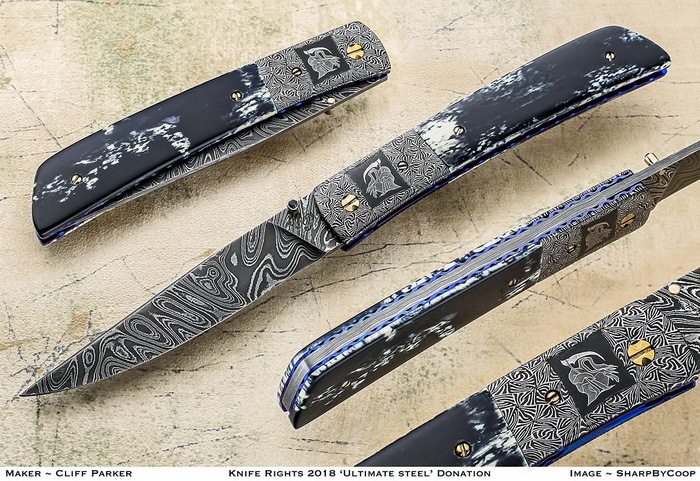 The bolsters are of Cliff's signature Mosaic Damascus, in this case featuring a Grim Reaper embedded within the Damascus. Handles scales are Mammoth Ivory , which Ivory is also inset into the thumb stud. Screws are heat colored stainless. The blue anodized titanium liners are meticulous hand fileworked. Before I tell you a little about myself, let me thank you for taking the time and interest to stop and look at my work. Unlike most knife makers I did not want to make knives at a young age, to be truthful I did not even know there was such a thing as a handmade knife until 1993. That is when I saw a Damascus folder, then a couple of weeks later I saw my first mosaic Damascus. That turned my world upside down and I have not been the same since. And by the way I bought both those knives. I collected until 1996, when I decided Knife making would be a good hobby, dreaming of some day possibly being able to get out of the sheetrock trade and into making mosaic Damascus gentlemen’s folders. Well I was very fortunate, and in 2000 for one of my wife’s birthday presents I decided to try to become a full time knifemaker, boy was she excited. I guess luck has been on my side because I have not had to dig those old drywall tools back out. I forge all of my own Damascus. I really enjoy theme knives, forging an image of something and using handle material from what ever the image happens to be and for an added touch, setting a piece of the same material in the thumbstud. I use nothing but the best of materials. My knives are known for being very slim, light weight with very smooth actions and first class fit and finish. All liners are fully fileworked anodized titanium. I would also like to thank all of the knifemakers who helped me along the way and a “special thanks” to all the people who have purchased my knives, for without them none of this would have been possible.